Prabhakar Barwe, who passed away in 1995, was a prolific writer and visual thinker in addition to being a distinguished painter. This exhibition commemorates Barwe in both these aspects. It comprises a range of works, beginning with life drawing studies and sketches from his college days in the mid-1950s and continuing through his designs and the explorations of his Tantric phase, to conclude with the symbolist abstract works that he produced from 1980 until his untimely death at the age of 59. The exhibition includes a large trove of works from the artist’s family that have never been exhibited before, accompanied by a selection of canvases on loan from major private collections. Important archival material about the artist in the form of articles and photographs will also be on display and accessible to viewers. 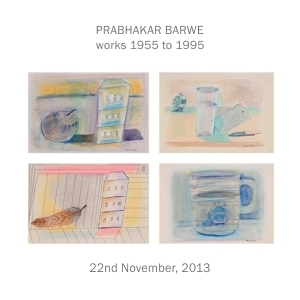 Prabhakar Barwe would meticulously note his thoughts and observations about art and life in a relay of diary entries consisting of word fragments, considered texts and drawings. He began these notations in 1972 and continued until 1995. A few of these diaries will be displayed by digital means.